A week after we saw Starbucks roll out their holiday season drinks, McDonald’s has announced that they too will have a seasonal drink. Both of these companies will only offer these drinks over the year ending holidays. 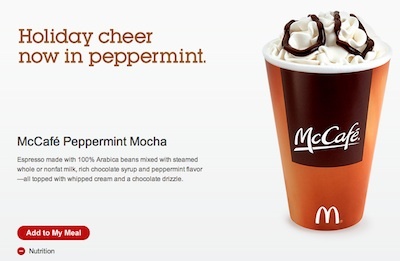 For McDonald’s, we get the Peppermint Mocha, bot as a coffee drink and a hot chocolate drink. The addition should be a nice add to their product line. A product line that I have read makes up 20% of the total sales McDonald’s does. To make sure plenty of folks try, love, and buy the new Peppermint Mochas, there will be sampling dates around the US. Keep an eye on the McDonald’s twitter posts (@McCafeYourDay and @McDonalds) for a mention of a town near you. Next post: Are you subscribing to your espresso beans?